When it comes to kitchen countertops, limestone is a beautiful and heat-resistant choice. The natural material is available in various shades from sandy beige to grayish blue. While limestone is more porous than other stone options, a penetrating sealer will keep the material's color intact while making the surface more stain resistant. Even better, limestone slabs typically cost significantly less than marble or engineered quartz. If you are planning on remodeling your kitchen, the following limestone countertops will inspire your renovation. Homey kitchens are the most inviting as is the case with this rustic-inspired yet contemporary cooking space by Staprans Design based in Mountain View, California. Along the walls are gray limestone countertops. Topping off the kitchen island is maple butcher block. Here Jerusalem gold limestone counters compliment the minty green cabinetry in this traditional kitchen by Fitz Harris Designs situated in Arlington, Virginia. Over the kitchen island are three pendants from the Landmark Lighting Chadwick Collection. The spanking new kitchen windows allow southern light to fill the cooking space. A modern farmhouse dining table with sturdy turned legs sprinkles on a little country charm. There is plenty to love in this traditional white cooking space, which is brimming with homey appeal. Remick Associates, based in San Francisco, California, did not allow an inch of surface space to go to waste thanks to the Ramon gold limestone countertops. Not only do they warm up the neutral color scheme, but they also provide plenty of space to prep, cook, and entertain. Because the kitchen is in an open concept home, the gorgeous kitchen cabinetry resembles beautiful furniture. The hardwood floor throughout the main floor adds to the sense of continuity. Beige limestone countertops are a perfect match for dark wood cabinetry in this French country inspired kitchen by Kyle Hunt Partners, a construction firm based in Wayzata, Minnesota. The backsplash, which is also limestone contributes to the room's neutral color scheme. We appreciate how the apple green dining chairs on the left create a little separation from the kitchen and main dining area. Studio Dearborn an interior design firm out of Westchester, New York created this transitional cooking space, which features Pietra Cardosa Limestone countertops. Over the kitchen island is a pair of Arteriors Garrison Conical Pendants. The stained oak and metal stools are both a rustic and minimalist approach to counter seating. This chic white kitchen by Jean Stoffer Design situated in Michigan combines a striking white coffered ceiling with luxurious stone countertops. The kitchen island and work surface on the left are Belgian blue limestone. The countertop in front of the window is white marble. When it comes to remodeling ideas that stand the test of time, you can never wrong with a traditional white cooking space. This example by Cameo Kitchen Inc., out of Falls Church, Virginia drives our point home. The countertops are Durango limestone in a lovely shade of beige. The custom cabinets feature beadboard panels for texture. Over the sink is a handy plate rack that adds both function and style. The interior design firm, Studio Dearborn out of Westchester, New York joined forces with architect Zach Schweter when creating this cooking space in an open concept home. The sizable kitchen includes a large island that can comfortably serve four people. Topping it off is gorgeous Pietra Cardosa limestone in a chic shade of bluish gray. The attractive stone surface pops against the clean, white cabinetry. This small cottage cooking space by Los Angeles, California based Amy Sklar Design packs many smart features that add both style and function. Shaker style kitchen cabinets are a timeless investment that adds loads of storage. The honed Lagos Azul limestone countertops coordinate beautifully with the black and chrome appliances, and jet oven hood. 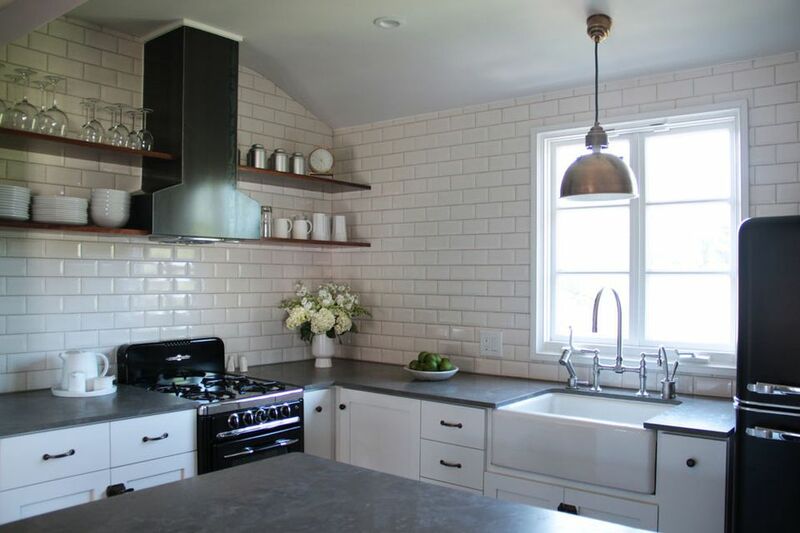 Covering the walls are subway tiles punctuated by dove gray grout. Beautiful dark limestone adds visual interest to this cream toned kitchen by Sutton Suzuki Architects out of Mill Valley, California. The dark stone pairs beautifully with the stainless steel appliances.